The American Health Information Management Association (AHIMA) is the premier organization in the world for health information management, coding, health data analysis, and healthcare privacy and security professionals. Those with an AHIMA certification have greater earning potential, more opportunity for career advancement, and a broader professional network than those without AHIMA certification. Completed coursework or otherwise demonstrated proficiency in the areas of anatomy and physiology, pathophysiology, and pharmacology. Used coding appropriately for physician services in multiple settings, such as a hospital, an emergency room, an operating room, and a doctor’s office. The RHIA (Registered Health Information Administrator) credential and a minimum of one year experience in healthcare data. Assist in the development and maintenance of the data architecture and model to provide a foundation for database design that supports a healthcare business’s needs. Establish uniform definitions of data captured in source systems to create a reference tool to be used as a data dictionary. Formulate validation strategies and methods to ensure the accuracy and reliability of data. Evaluate existing data structures using data tables and field mapping to develop specifications that produce accurate and properly reported data. Integrate data from internal or external sources in order to provide data for analysis and/or reporting. Facilitate the update and maintenance of tables for an organization’s information systems in order to ensure the quality and accuracy of the data. Analyze health data using appropriate testing methods to generate findings for interpretation. Interpret analytical findings by formulating for clinical, financial, and operational processes. Validate results through qualitative and quantitative analyses. Design metrics and criteria to meet the end user’s needs through the collection and interpretation of data. Generate routine and ad-hoc reports using internal and external data sources to complete data requests. Present information in a concise and user-friendly format by determining target audience needs. Provide recommendations based on analytical results in order to improve business processes and outcomes. An RHIA (Registered Health Information Administrator), or an RHIT (Registered Health Information Technician) credential with a bachelor’s degree or higher and a minimum of two years experience in healthcare management. 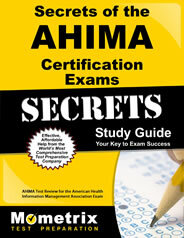 Ace the AHIMA test using our AHIMA exam study guide with practice questions. 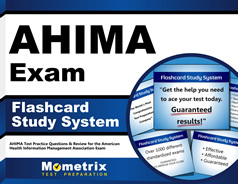 Quickly Solve Difficult AHIMA Test Questions with the AHIMA Flashcard Study System.